The tests of the Durance - The quest starts automatically when you absorb Durance in your group. You can find him somewhere near the middle of the map at the Magran statue (2). You need to complete the quest not pursue targeted because it occurs automatically when you have rested a few times and entertain with Durance. It is therefore sufficient Durance to keep for a while in the group and in between to rest. 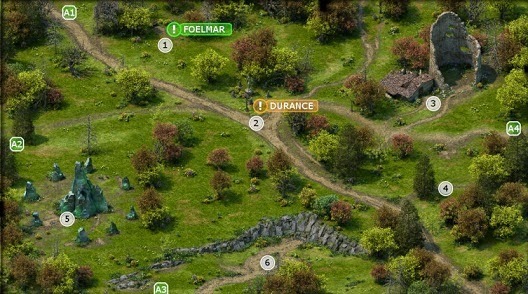 You should first follow the road east until you meet Foelmar (1) from the starting point in the northwest of the map (A1). Talk to him and then defeat the two wolves that appear and Foelmar reward you with three soaking the small endurance. Make your way then back on the road and follow it up to about the center of the map. There you will find a Magranstatue (2) and Durance, one marked by life human priest, who knows a thing about you. In dialogue with Durance you will find out that he would like to join the group because he claims to have seen the main character in a vision in the flames. Durance will also recognize that the main character is a guardian and can interact with souls. If you offer him decide to travel with Durance, so you get his companion quest "The test of the Durance," the more spins gradually over call to the click from itself and close. Proceeding to the ruins in the northeast and the adjacent small cottage (3). In the fragile rotunda you meet a Will'O'Wisp, the Crafting item Orlan pick cradle and find an amethyst, a skeleton and four copper-Skeyt behind a loose brick. The cottage next door is deserted - in the containers can be found but among other fruits, vegetables, a skeleton and a rope with grappling hooks. About the Eastern card output (A4) you can open up the area as a tourist destination on the world map. Go further south - where you expect a woman named Ludrana and two gold Pact paladins who attack you without hesitation and without seeking the conversation. Ludrana can conjure up, but holds out little - first turn her. The Paladin then are no longer a problem. You can sometimes from the group Ludranas spell book, a two-handed sword +3 agility, a wand, four gold Suoles, 25 copper Skeyte and Ludranas commands loot. The latter reveal to you a little more about the motives of the attack. Continue to the west. In the center of the map, just south of the Durance and the Magranstatue you'll encounter a horde of wild boar, three adult specimens and a juvenile, to be exact. Further east, there is a formation (5), which are currently for you irrelevant. A total of six wolves are distributed on the west side of the card, which can kill you, if you want your bestiary dine with new information. Otherwise, you can still go south and follow the path to the little bay (6), at the end of a forest troll waits (can troll skin fall). Kill the troll and loot the body - you will find Fulvanos amulet, three gold Obel Constitution +2 and a chewed letter, which is about the search for Fulvano - the man of whom you will find equipment again and again in the course of your journey. There is nothing more to do in Magrans bifurcation. About the South Exit (A3) you come to the world map, where now Anslogs compass is unlocked.